The world of work is changing rapidly and dramatically. It offers a myriad of new options and opportunities. However, there are no best practices or blueprints of workforce design indicating how people are supposed to interact with their human and high-tech counterparts. What we need is to take the courage to experiment. Countless studies demonstrate what has been obvious for quite some time: The world is changing and becoming more complex and volatile with fast-paced developments. These changes are driven by new technologies. They turn the world into a chip connecting everything and everybody and enabling humans and machines to communicate back and forth. Consequently, our society, economy, and world of work are changing fundamentally. Work is done beyond time and space. The process and progress of attaining results, making decisions, and innovating are accelerating at an incredible speed. We need new capabilities for new job profiles. Human and artificial intelligence get together. Machines support or replace manpower. There’s also a shift in our attitude towards our world and work. People are in search of self-determination, self-perfection, and a sense of meaning. The material aspect of value creation is more often than not complemented by a non-material equivalent. Taking responsibility for individuals, society, and the environment as a whole is not just an imperative of sustainability, business ethics, and morale but also a lever of talent acquisition and development. The new logic of leadership and labour organization has less and less in common with the industrial era’s paradigms of efficiency and rationalization. People start questioning hierarchies whereas organizations bridge conventional gaps between business silos. The race and pace of innovation require a much higher level and relevance of creativity combined with engineering virtues and common process thinking. A company used to be a ‘firm’ as the Latin word ‘firmus’ for strong, steady, stable indicates. Well, not any more. Employment relationships are re-defined and re-designed. Companies work with permanent employees as well as with freelance talent who get together for clearly defined projects in order to move on once the job is done. Virtual platforms assist with matching labour supply and demand. The gig economy may eventually provide self-determination and perfection but also entail precarious work-life situations. A new world of work raises two major questions: How are we going to collaborate effectively in the future? How can we ‘assemble’ our workforce in order to deal with new challenges and chances? Both questions culminate in workforce design: How are we going to design work, work environments and communities in a world with a myriad of new options? Experts and practitioners in politics, science, and companies are frantically searching for answers. However, these are anything but obvious. There are no blueprints as increasingly complex questions no longer produce straightforward, simple answers. What works in one setting and situation, fails in another. That’s why we strongly believe in the value of experiments – and we are not alone. In 2016, Chief HR officers of corporate Germany realized that there is no master plan for future work design that may anticipate all kinds of developments and offer unambiguous policies and procedures. Thus, they say, experiments are needed to deal with transformation issues. Lynda Gratton, a renowned British management professor and organizational researcher at London Business School, states that experimenting is crucial in an increasingly complex business environment. Her German colleague Hans A. Wüthrich at the Universität der Bundeswehr in Munich is convinced that working upon the system itself, i.e. questioning the status quo and experimenting considerately, will become an inherent part of leadership responsibility. Antoinette Weibel, advocate of evidence-based management and director at the research institute for work and work environments at the University of St. Gallen, even thinks that experiments are key to figure out what works with new ideas and what kind of impact they may have. She explains that only experiments will help us verify cause and effect relations and chains. Moreover, experiments generate hard facts for the legitimization of extensive investments in new approaches and methodologies. Politicians have received the message. With its initiatives in the context of the fourth industrial revolution, the German Ministry of Labour and Social Affairs promotes the establishment of so called ‘rooms for learning and experimenting’. It would like to encourage and enable companies and organizations to test, initiate, and implement new ways of working. Corporate space for learning and experimenting should be an ingredient of a ‘learning labour policy’ and of a comprehensive research, innovation, and transformation strategy. Business units close to markets have been using experiments for quite some time. Product developers and marketing experts test ideas bevor putting things into practice and thus set a precedent. The paradigm of just doing it has become the guiding principle of all activities within corporations like Microsoft and Google. Against this background we started Projekt 3T – The open Platform for Workforce Design. We would like to initiate and facilitate experiments for a world of work full of new options. We plan to share and spread knowledge and insight gained from these experiments. We do this together with the best and boldest pioneers and thought leaders coming from theory and practice, from companies and non-governmental organizations, from research and politics. For further information please visit our website. What are the prerequisites of experiments? need courage as business cases may be unclear and experiments may fail. need backing and (moral) support. Taking risks and trying things need to be considered necessary, valued, and appreciated behaviour even if there may be no immediate results that can be used somehow. need time and resources. When stuck in daily routines, no one has the time or peace of mind to even think about experiments. need focus. They have to clearly define the experiment and direct it towards answering a specific question or solving a concrete issue in order to obtain results, to compare the situation before and after the experiment, and to gain insight into the relationship of cause and effect. need expertise. In order to design and implement experiments they need to know how to do it and what to pay attention to. Experience and inspiration from people who have done similar experiments in another context are even more important. What is the outcome of experimenting? By experimenting officially, systematically, and visibly within an organization, people contribute to a corporate culture that demonstrates and values courage and innovation. Taking risks in a monitored and protected work environment as well as continuous learning become the guiding principles. By experimenting a person gains new insight and acquires new learning even if the experiment does not provide immediate solutions for the initial problem. This approach is the foundation of real progress. By experimenting systematically and expecting a success rate of more than fifty percent, a person may have the opportunity to find new and sustainable solutions for challenges that are not covered by good practices or blueprints (yet). 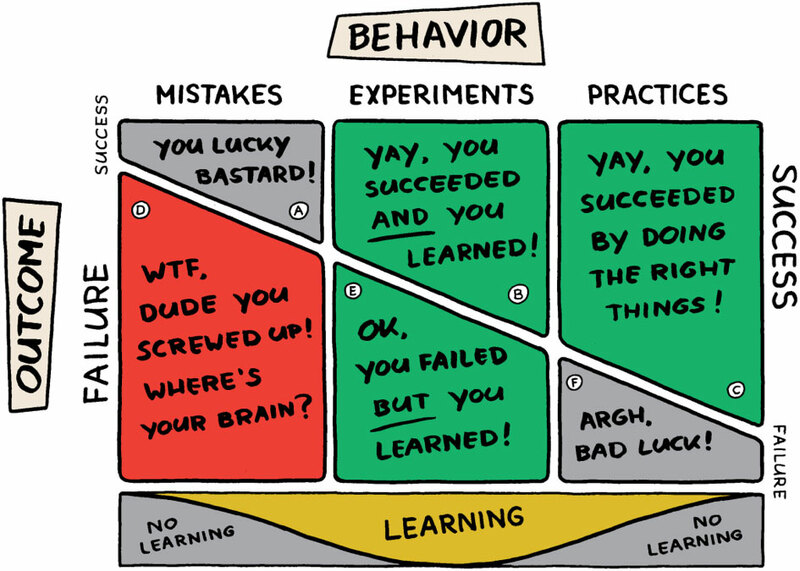 With his so-called celebration grid, the Dutch thought leader Juergen Appelo beautifully illustrates the necessary attitude towards experimenting. Professor Hans A. Wüthrich and his team have nicely put what it is all about: ‘Not everything we try works – but everything that works has been tried before.’ So, let’s do it.